Apple's online store is now listing a new Blackmagic eGPU "Pro", following several major product launches today. The eGPU is compatible with any Thunderbolt 3–enabled Mac, including the new space gray Mac mini and new MacBook Air with Retina display. The Blackmagic eGPU Pro costs $1,199 and will be available to order from the Apple online store from late November. RX VEGA 56 is ~ $ 449 and an eGPU box is ~ $ 350, totals ~ $ 799. I would consider this new eGPU kind of f*cking expensive. Isn't Nvidia much better than amd? I mean does a 1080TI outperform this radian card? Will they add LUT support to supplement a 2nd monitor via the hdmi port? GregGreenhaw wrote: Isn't Nvidia much better than amd? I mean does a 1080TI outperform this radian card? Ya, but Apple and Nvideo got a divorce. Apple is dating AMD now. Noticeable in the picture below, Blackmagic eGPU Pro also features an additional DisplayPort that supports 5K monitors. 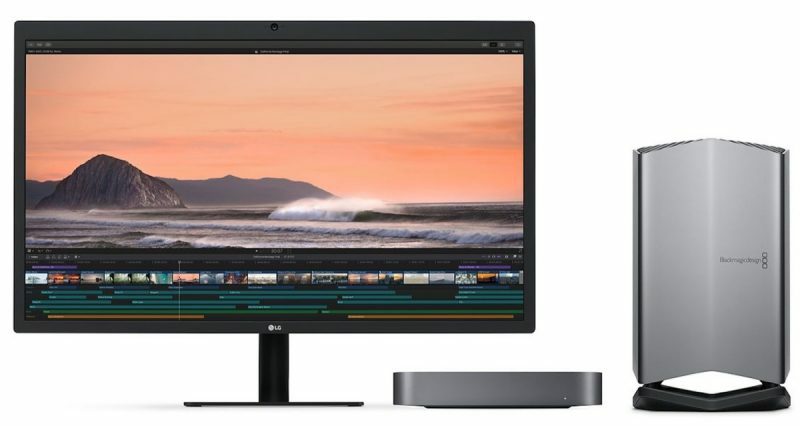 your graph only shows the 580 vs whatever is in the MacBook Pro 13"/15"
Peter Odio wrote: Noticeable in the picture below, Blackmagic eGPU Pro also features an additional DisplayPort that supports 5K monitors. Yes, but still no video I/O in that box. I would only call it 'pro' at that price point if it would support direct connection of a calibrated screen – as recommended for any serious grading by BM. I had it in my head that there was a Pro Vega 64 option for the BMD eGPU. Was I daydreaming? I am thinking, it is a bit too expensive, not having even USB ports for connecting control devices. Low noise is nice, but the MacBook pros are not that noiseless under load anyway. It should have something extra for that price. Why is it available only at Apple, probably that explains the 30% extra on the price. All four USB 3 ports are USB 3 Type A. Agree price seems high. There seems to be even more price gouging stepping up to the Pro compared to the original GPU in Canada. Original $699 USD, $899 Can; Pro $1,199 USD—$500 more, $1,649 Can—$750 more. My mistake, well at least it has USB ports, they are pretty important. I was thinking going the eGPU route tested one inexpensive HP RX 580 setup (got it 400 euro) and it felt pretty ok with MPB 13" 2017. It had also place for SDD. The problem was, it had all kind of problems, did not charge the computer, crashed after sleep etc, so I returned it. Then came the BMD RX 580 eGPU and it felt adractive, but just a bit too expensive. Few weeks a go I got a really good deal on MBP 15" 2018 with RX 555 so got that, have not really tested it yet with Davinci, but should be pretty ok.
As it happened I got also Mac Pro 2009 at 250 euro, so could not resist. It is dual prosessor and now updated with 12 core (actually 2 of 6 core) 3.5 GHz xeon processors, SSD, 64 Gb memory and RX 580 . So not so inexpensive any more but well below the new BMD eGPU price and it has PCI slots, it actually came with an old Decklink card that has SDI and HDMI in and out. Also did put 4 old 2Gb HD on it, they provide over 500 Mb/s rates in 3 disk RAID0, not bad. At home I have Mac Pro 2013, it is working very well with FCPX and I quess also with Davinci. I hope there would be clear comparation between the above mentioned systems. It is not easy to find information how much different things like how much memory, RX 580, Vega 56 or 64 etc affects the real life experience. Kim, the charts posted earlier may help. But for me, the Barefeats benchmarks, posted a few weeks ago, convinced me that the 13” MacBook Pro with i5 processor was a better value with the original eGPU added than the 15” with i7. The i9 was no better than the i7 due to other design constraints. Take a look at those benchmarks that I trust more than numbers Apple published. I bought 2 of the 13” MacBook Pros for the girls and if either of the girls needs more graphics power, I’ll add the BMD eGPU. I am not using the Davinci currently but thinking going to that direction in future. Kim, the complications arise in the MacBook Pro 15” due to the discrete graphics processor on board. The 13” doesn’t have that and is greatly enhanced by the eGPU. Will watch for Barefeats to update their BMD eGPU benchmark when they get access to the new Oro Vega 56 version. Is there some DaVinci test projects available, that could be used to test the system. Would be nice for BMD to provide the test projects used on the above graphs. It would be nice to see what kind of results other get with their systems, with some kind of standard real life skenario test. The most important test for me though is that the timeline plays smooth and the UI is responsive. My video projects are not that big and not that many. As for example on the Mac Pro 2009, when it was still 8 core 2.2 GHz with RX580 it was struggling badly playing back GH4 4k .MOV files. They played back ok for a second and then not so for an other when played in DaVinci or Quiktime. VLC was much better but not perfect. It was using 300% CPU so that was not really the problem. Now that it is upgraded to 12 core 3.5 GHz , the playback is better, but not perfect. There was similar problems reported with the RX580 eGPU and MBP... who knows, maybe it is the RX580, maybe older generation GPU, with eGPU maybe the Thunderbolt3... Also the Cinebench gives pretty bad results for the Mac Pro 2009 with RX580 on OpenGL test, especially with the above mentioned 8 core setup. Heaven gives better, more like what is expected. It's not the GPU, it doesn't decode the GOP codec in that case. The GPU will be your limiting factor when you add lots of corrections and filters, but not in simple playback. The proof: try playing back some Braw. It's all about the codec. Kim, Barefeats independent testing is likely as good as any as they are not linked to any hardware or software products. Vendor tests are always suspect as their content and methodology are not published in any detail so it’s possible the tests are skewed to their advantage. Kim Janson wrote: Is there some DaVinci test projects available, that could be used to test the system. Would be nice for BMD to provide the test projects used on the above graphs. There are some "standard candle" Resolve tests discussed at length on LiftGammaGain.com. Apple's new Blackmagic eGPU Pro, first introduced alongside the Mac mini and MacBook Air in late October, can now be purchased from the online Apple Store. Orders placed today for the $1,199 new eGPU are set to be delivered from January 15 to January 23. It's not known how much stock Apple has available, so those delivery times could slip after the first orders are placed. The Blackmagic eGPU Pro features a Radeon RX Vega 56 graphics processor with 8GB HBM2 memory, two Thunderbolt 3 ports, four USB 3 ports, an HDMI 2.0 port, a DisplayPort 1.4 port, and 85W of power delivery, enough to power the 15-inch MacBook Pro. Like the prior non-Pro Blackmagic eGPU, the new version features an all-in-one aluminum enclosure. All of Apple's Thunderbolt 3-enabled Macs, including the Mac mini, the MacBook Air, and the MacBook Pro, work with the Blackmagic eGPU Pro. When the eGPU was announced, Apple originally said it would be released in late November, but Apple later updated the product page to note that it wouldn't be released until December. Apple hit the December deadline, but deliveries won't begin until 2019.